It’s all change in France again next year as the successful Top 8 becomes a Top 16 with its merger with the second level Armelle Auclair league, and the last Top 8 final sent the league off with a thrilling and exciting display. The teams with the two biggest and most powerful packs met at the Albert Domec stadium in Carcassonne, Montpellier, going for their 7th title, and young upstarts Stade Toulouse, who did not exist (under tha name at least) when the first Top 8 began. And it was the new kids on the block who lead for most of the match. They may have been unable to find a way through the Montpellier defence, but Camille Boudaud was on target with the boot, punishing Montpellier infringements. Three penalties in the opening the first half put Toulouse in the driving seat, going into the break 9-0 ahead. A converted try from Fantine Bacchichet for Montpellier pulled the defending champions back into the game, but a fourth penalty saw Toulouse lead 12-7 midway through the second half. A yellow card against Laura Ménétrier saw Toulouse down to 14 players as the game entered the final quarter, and while she was off a penalty from Marion Peyronnet pulled Montpellier to within three points. Entering the final ten minutes, Montpellier were camped in the Toulouse line. 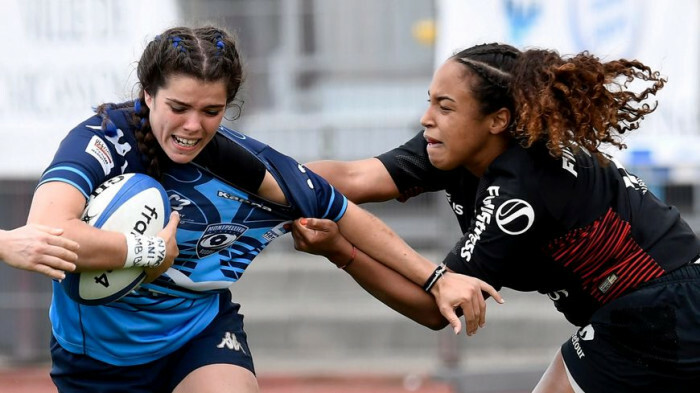 The forwards could find no way through, but a quick pass to the left saw Marie Vanthournout with space in front of her – and Montpellier lead for the first time, and with no more scores, 15-12 was the final result. And so the Top 8 comes to an end with a final as close as so many games in the league have been, and especially the play-offs. But final news of the weekend came from the north, with the surprise departure of Lille’s coaching team of Damien Couvreur and Guillaume Bacharach, who have seen the northern outpost climb from the second division to eight successive semi-finals, four Top 8 finals, multiple national sevens championships and Top 8 winners in 2016. One of the reasons by the coaches given was the reorganisation of the league.